When it comes to progressive jackpot games, Mega Moolah is the biggest beast around, and has been for a decade. The super popular slot can be played at a host of Microgaming casinos and offers plentiful payouts aside from the jackpot. The big money, however, comes from the four progressive jackpots, the largest of which holds the record online slot payout at £13.2 million. The game’s main theme is Africa and its wildlife. Symbols like the Gazelle, Giraffe and king of the animals, the Lion, along with the background sounds of the jungle do a fantastic job of bring the African savannah to life. Mega Moolah is a very versatile 5-reel, 25-payline slot. It offers multiple ways of winning during the base game, as well as Free Spins and the Progressive Jackpot bonus game. The Lion is the very appropriate Wild symbol in the game, and it substitutes for all other symbols and doubles any win it is a part of. Additionally, hitting five Lions will net you the game’s biggest base jackpot of 15,000 coins. Sure, it’s not £1 million-plus, but it’s a pretty generous jackpot for the base game. Free Spins are triggered by hitting three Scatters, which in this case is represented by the game’s Monkey symbol. All winnings during the free round are trebled. All wins during the Free Spins are tripled, which makes for potential x6 payouts when a Wild Lion Symbol is involved during the Free Spins round. Finally, the higher you bet, the more chance you stand of triggering the Bonus Game, which is where you get the chance to spin the big wheel to win one of those four elusive jackpots. The wheel is divided into 20 sections, with 10 sections paying out the Mini jackpot, six sections paying out the Minor jackpot, three sections paying out the Major jackpot, and just one netting you that millionaire-making Mega jackpot. Mega Moolah offers four different progressive jackpots. Which jackpot you take down is decided by spinning the wheel in the randomly-triggered bonus game. 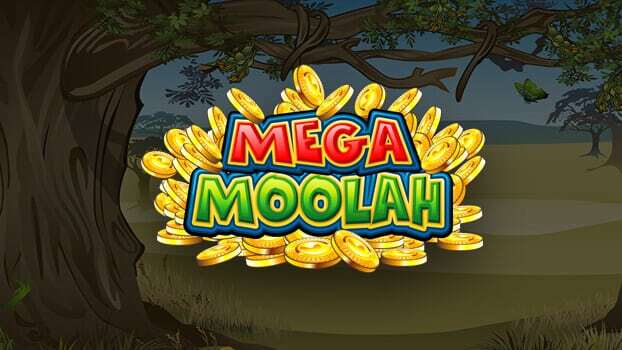 As we already mentioned, the main theme of Mega Moolah is Africa and the creatures who live there. The entire game is made in this style, with African animals appearing as symbols and background noises simulating the sounds of the savannah. The overall feel of the game is very cartoonish. While the game doesn’t feature terribly advanced graphics, it is made to a fairly high standard and the symbols are well drawn, which is consistent with other Microgaming slots that tend not to feature any extra fancy graphics. One thing that is sure is that the audiovisual feel of the game is very enjoyable and you won’t regret investing a few quid in this experience. The game is also available in various other themes, including the Ancient Egypt-themed Mega Moolah Isis. Mega Moolah is probably one of the three most popular video slots out there, and for good reason. The game features an interesting and distinct audio-visual identity and offers plenty of chances for solid wins along with the massive, life-changing jackpot that has made so many new millionaires. It may not have the most interesting features but it keeps on drawing in the players in droves.